Virat Kohli was in scintillating form during India’s tour of Australia in 2014-15. He scored 692 runs in 8 innings at an average of 86.5 including four hundreds and one fifty. His twin hundreds – 115 and 141 - in the opening Test at Adelaide almost took India to a miraculous win. This was only the second instance of an Indian scoring a hundred in each innings of a Test Down Under – Vijay Hazare scored 116 and 145, also in Adelaide, in 1948. Only four other opposition batsmen have achieved the feat – Sutcliffe, Hammond, Compton and Kanhai. Kohli’s aggregate in the series was the highest for any Indian batsman in any series in Australia – beating the previous best by Rahul Dravid (619 in 8 innings in 2003-04). In fact, it was the fifth-highest run aggregate for any opposition batsman in a series in Australia after Hammond (905) in 1928, Cook (766) in 2010, Sutcliffe (734) in 1924 and George Faulkner (732) in 1910. Kohli, overall, has scored 992 runs in 8 Tests (16 innings) in Australia. He has five hundreds and two fifties Down Under. His average of 62 in Australia is his best in any country outside India barring New Zealand (averages 71.33 in New Zealand but has played only two Tests there). Kohli has the highest batting average among all Indian batsmen who have batted in at least 10 Test innings in Australia. His frequency of getting hundreds is also the best for an Indian batsman in Australia. In fact, no other batsman from the sub-continent has a higher batting average (min. innings 10) than Kohli in Australia. His frequency of scoring a hundred is also the best among Asian batsmen (every 3.2 innings). The numbers only get better. 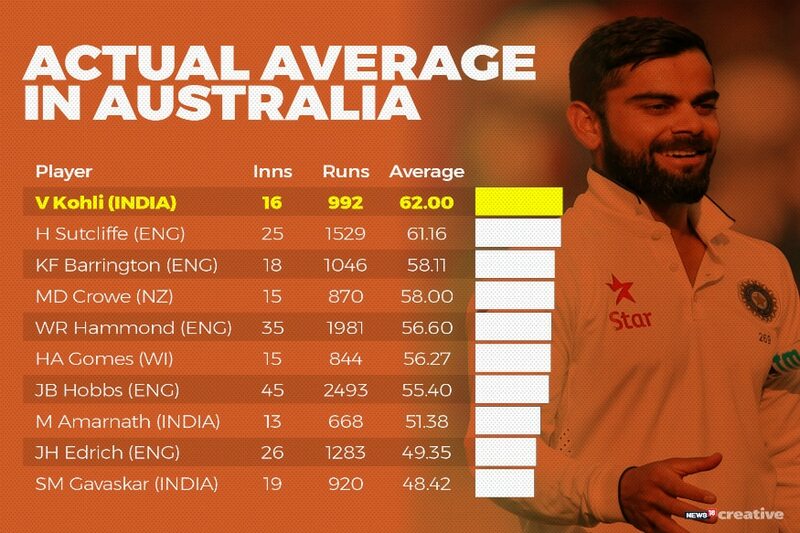 If we compare him to all visiting batsmen (minimum 8 matches and 400 runs in Australia), we see that only Gomes, Barrington, Crowe and Sutcliffe have a higher average than Kohli in Australia. Here is an interesting stat though: if we consider Actual Average (runs scored per innings), then Kohli’s average of 62 is the highest among the 114 overseas batsmen who have played in at least 8 matches and scored a minimum of 400 runs in Australia. 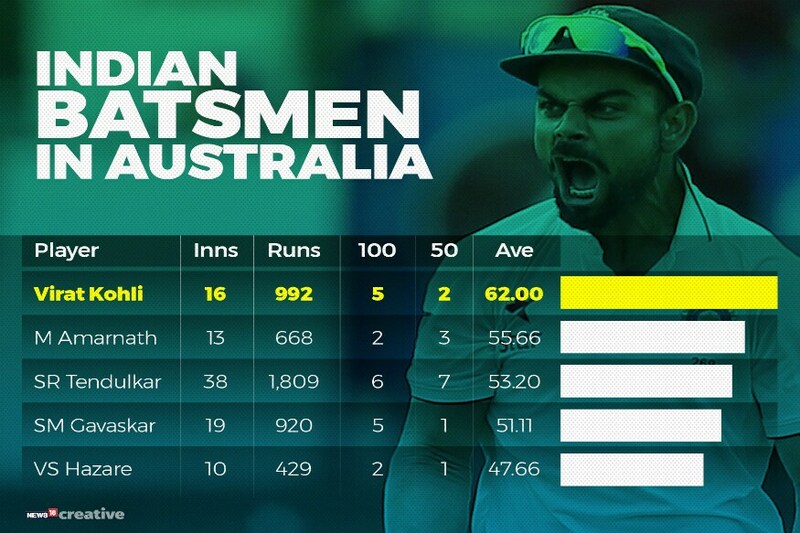 That is a staggering record and that is how good Kohli has been in Australia. Kohli’s frequency of scoring a hundred is the best among these 114 batsmen. He is followed by Gomes (every 3.75 innings), Gavaskar (3.8), Sutcliffe (4.17) and Barrington (4.5). Kohli has scored 21.55% (992 runs out of 4604 team runs) of India’s total runs in Australia during his career. The corresponding percentage for Tendulkar is 16.85%. This shows Kohli’s dominance as a batsman and India’s dependence on their captain. 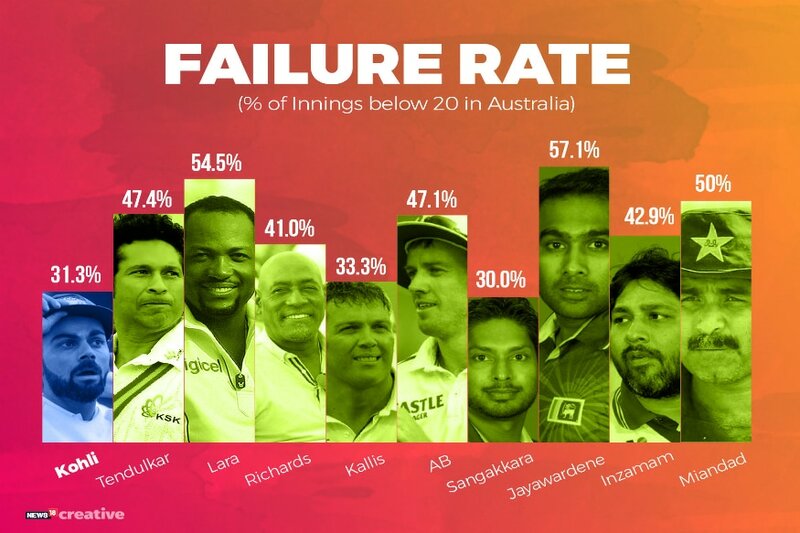 Kohli’s Failure Rate (percentage of scores below 20) of 31.25% (5 innings of below 20 in 16 innings) is among the lowest for an Indian batsman (min. 10 innings) in Australia. Just for perspective, Tendulkar had a failure rate of 47.37%, Dravid (46.67%), Laxman (44.82%), Sehwag (35%), Ganguly (45%), Azharuddin (58.33%), Vengsarkar (46.42%) and Gavaskar (52.63%). Amarnath (30.77%) and Viswanath (20%) are the only two prominent Indian batsmen who have a lower failure rate than Kohli in Australia. In fact, Kohli’s Failure Rate compares favourably to a number of all-time greats who have played in Australia. Overall, there are only ten batsmen (min. 15 innings and 500 runs) who have a lower failure rate than Kohli in Australia – Barrington (11.11%), Crowe (20), Viswanath (20), Hobbs (22.22), Hammond (25.71), Gomes (26.67), Edrich (26.92), Sutcliffe (28), Leyland (30) and Hussain (30). The sub-continent batsman next on this list is Zaheer Abbas (35.71%). Kohli’s batting average from Number 4 of 86.5 is the highest for any opposition batsman in Australia from the position (minimum 8 innings). He is followed by Crowe (66.92), Barrington (66.28), Gomes (63.60) and Tendulkar (58.36). Kohli will once again be the pivot around which the Indian batting will revolve. Expect more staggering numbers and more records to be broken in Australia.